Updated Friday July 1, 2016 by AUBL Miami. Jays took an early 3-0 lead in the 1st inning on hits from Ryan Herzon, Diego Zambrano, Ibrahim Lara, and Jordan de la Cruz. Bats answered in the 1st inning with 1 run on Danny Diaz RBI hit.Jays added a run in the 2nd inning, but was answered with 4 runs in the 2nd by the Bats for a Bats 5-4 lead after 2 innings. The game settled down and so did both pitchers. Bats Daryll Roque was shaky in the 1st 2 innings, but hung tough and pitched 8 strong innings. Anthony Castillo started for The Jays, but only lasted 3 innings. Andrew de la Torre relieved Castillo and at one point had 6 straight strikeouts! The Jays scored a run to tie the game in the 4th. In the 6th inning, Alexis Valladares (player of the week) hit a massive 2 run bomb over the right field wall to take the lead! The Bats would add an insurance run in the 8th to win 8-5. Giants were up by 5 runs in this game mid way through. Giants Carlos Garrido (honorable mention for player of the week) was 3-5 and hit a massive bomb to left center. The Marlins came back late on a double by Carlos Garcia (also honorable mention player of the week). Garcia was 3-5, 3 run HR, 5 RBI's. Well played, exciting game by both teams! Eventhough the expansion Giants lost the game, they will be a team to watch! by Giants Onih Acosta - Giants let another one slip away - It was a promising start for the 20 Giant faithful fans in the stands, after their team led through three inning thanks to a 3 run first and another run in the third. The Giants had another fantastic day with the bats as they hit around for 15 hits which included 2 Home runs and multiple extra base hits. Lead off hitter Fernando had 3 hits including a home run off the scoreboard in left center. Carlos Garrido also added a no doubter which went about 375 ft. Former Cuban ace Juan Carlos Reyes also shined on the bump with five innings of pin point accuracy and also kept hitters off balance with an array of off speed pitches and multiple arm angles. The Giants led throughout the game and were in the lead when Juan Carlos exited the game. In the end, the Marlins bats woke up and the Giants were not able to put them away. Up next for the South Florida Giants is a tough and proven Nationals team. The Giants look to continue their offensive prowess in search of their first win of the season. Reds cruised to victory behingd the smooth pitching of ex-Team Venezuela pitcher Jose Marcano. Michael Rudman pitched the final 2 innings. Alex Cuadra and Alfred Labrada led the hit parade for The Reds with 2 hits apiece. Ex-Major leaguer Juan Rivera also added a double en route to 10 hits for The Reds against a very tough Team Venezuela squad. by Justin Petrie - Dadeland Indians - New talent shines as Indians defeat the Miami Bears 7-3 for their first win of the summer season. The Indians were lead by Yansiel Agete who had a 3-run homerun in the first, 2 singles, a walk, 2 stolen bases, 2 runs scored, a number of dazzling plays at SS, and a set-up relief appearance in the 8th inning with 2 strikeouts. The Indians spent the entire game getting runners on base, and despite scoring 7 runs, stranded a number on base, or making outs at third and home with baserunning errors. In addition to Agete, Indians with multiple hits included Michael Hechavarria, Scott Lyon, Emilio Medina, and Yoel Rojas. Taylor D'Agostino had a strong start, going 5 innings and giving up only 2 unearned runs, despite a few errors in the field. Scott Lyon threw 2 scoreless innings in relieft, followed by Agete and Hechavarria to seal the win. The Indians carry hope to carry their momentum, and improve on their defense and baserunning in their next game, presently scheduled for Sunday July 10th at 10:00 a.m. at Coral Park High School. Storm led for most of the game behind solid starter Scotty Burman. The Nationals were able to come back late in their typical fashion to earn the win and a 2-0 record. 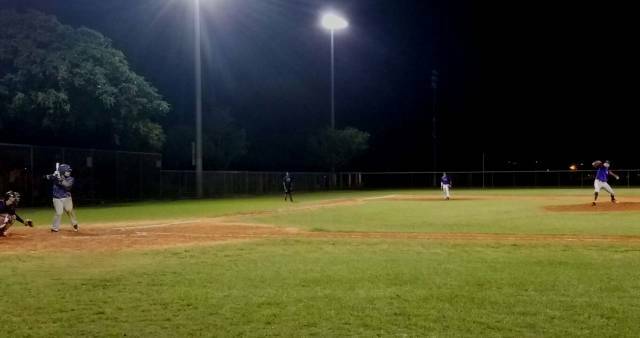 by Marlon Rodriguez - South Florida Sox - With both teams being off for almost 3 weeks the rustiness showed as the game was scoreless for te first 5 innings. Both teams showing solid defense kept the pace of the game going. Jordan de Los Reyes was tossing a no hitter into the 6th as he finally gave in for 2 runs only 1 earned. Sox always have been known to fight back and this game was no different. Scoring 1 in the 7th and and heading into the 9th down 2-1 sox came fight back to put the score 4-2 and that was all Jordan de Los Reyes needed as he said there is no shot U are taking me out this game. 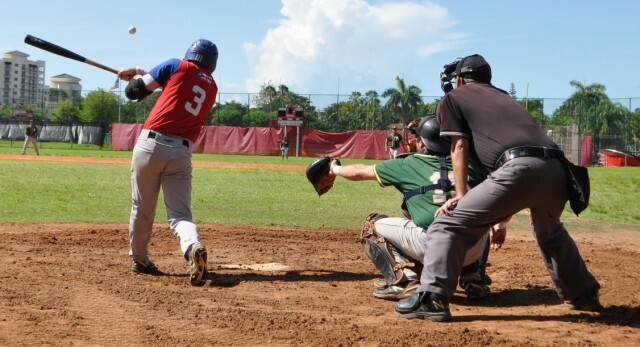 by Miguel Garcia - Coral Gables A's - After a two week hiatus, the Coral Gables Athletics matched up against Puerto Rico and played a great game on Sunday. Playing their first game in over 5 years in their long time home field, Coral Gables High School, the game had a level of nostalgia to it. The A's took an early 2-0 lead in the 2nd taking advantage of some aggressive base running as Luis Cabral scored on a passed ball and then Eric Perez stole home on a pick off attempt to 1st. PR answered with an unearned run in the 3rd but the A's quickly answered with an RBI single from Carlos Alvarez in the 3rd scoring Barry Rooks who had reached base on a HBP and then stole 2nd. The A's tacked on 2 in the 5th on an RBI single from Rooks and a SAC fly by Willy Mizrahi. The game seemed like it would come to an end as such with the A's leading 5-1 going into the final inning (8th - game was shortened by time) but PR scored 4 runs to tie the game. The A's quickly answered in the bottom half of the inning as Juan Quesada opened the inning with a sun assisted double to left field. Juan would eventually score from 3rd on a wild pitch with 2 outs to end the game. Alex Arteaga pitched a complete game striking out 5. Ulpi Puente, Rooks and Quesada all reached base 3 times in the game. Pee Wee Rodriguez, Cabral and Leo Portes all had hits while Willy Mizrahi and Eric Perez had 2 hits apiece. With the win, the A's improved to 2-0 and will next play Las Aguilas in two weeks after the July 4th weekend. Expansion Posoltega played well against the returning champs. Diamondbacks Hans Waltemath was brilliant, pitching a complete game and giving up 0 earned runs (2 unearned runs). Diamondbacks were up 3-2 in the 7th, when Jesus Prohias smacked a 2 RBI double over the center fielder's head. He would eventually score on Tony Sanchez' RBI hit. Nwecomers AJ Prado and Jesus Prohias played well for The Diamondbacks. Jorge Hernandez added 2 hits as well. Rockies get the win over Las Aguilas to start 2-0 this season. For Las Aguilas, Roger Villalonga pitched well 7 IP, 10 K's, 1 ER. It was the defense that let down Las Aguilas, giving up 6 unearned runs in the game. Bryan Charry had 2 hits in the loss for Las Aguilas.